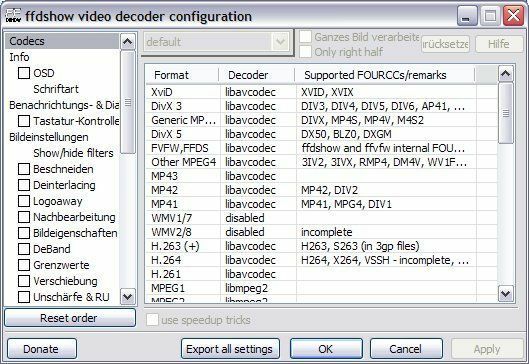 FFDSHOW 64-bit is a 64-bit compatible video / audio DirectShow decoding filter that can decompress several video formats, including AVC, MP4, Matroska/MKV, DivX, XviD, WMV, MPEG-4, MPEG-1 and MPEG-2 movies. Filter also supports decoding of virtually all audio formats used in movies, including AC3, DTS, MP3 and Ogg Vorbis, and several subtitle formats. The codec also features postprocessing capabilities, support for virtually all MPEG-4 video formats, support for various processor enhancements (such as SSE and MMX), etc. FFDSHOW is released as an open source software under GPL license agreement. To summarize its main idea, the FFDSHOW consumes way less CPU power than original DivX or XviD codecs, even with maximum post-processing. At the same time the post-processing seems to give excellent quality results and allows more configuring than the original DivX codec. It can even automaticly reduce post-processing if your CPU is getting overloaded. The noise filter adds a kind of a rasterising effect to the picture - might be useful in some cases. We also recommend that you read through our guide on how to install and configure FFDSHOW.